I decided that because my son’s last year at the Boston Regatta (Head of The Charles HOCR) was going to be held in October, and I hadn’t had a vacation from the work-from-home drudgery of sweat pant heaven with the daily grind of sitting with two dogs and a cat, that I would buy a plane ticket to Boston on a whim and join him. There are three firsts in this decision: Boston, traveling alone (that wasn’t business related), and finally, the use of an Air Bed & Breakfast (AIRBNB). Boston was bustling with activity in this month of October – and rightly so. 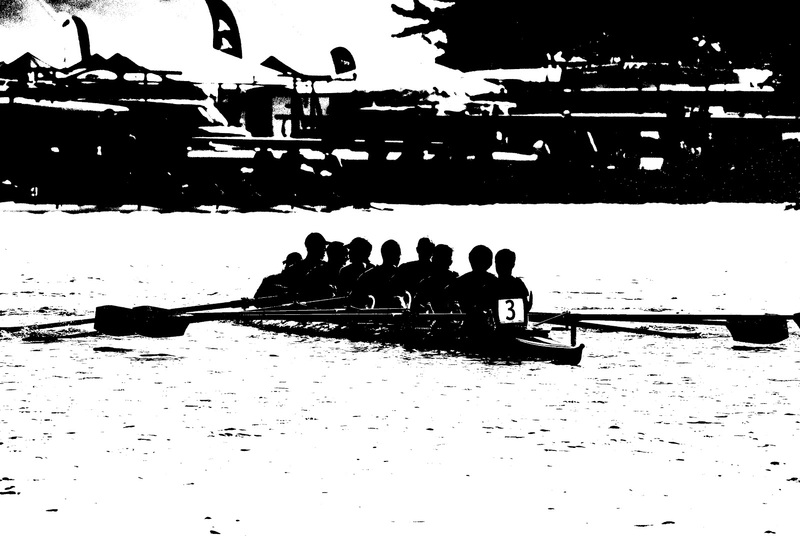 The HOCR draws over 9,000 athletes and 300,000 spectators (as reported by their web site) and has been an annual event since 1965. My son, a Georgia Tech rising senior, is a member of the crew team and has been attending the HOCR yearly but is limited by his fourth year so this was the last one for him (as a student). I enjoy being a crew spectator because in most circumstances you get to hang around a gorgeous water event, the athletes are all in tip top physical shape, and you get to bring your dog (although I didn’t bring one this time). Add to the mix, Boston was beautiful this time of year as the crisp winds of a pumpkin spiced Autumn come sweeping in. Historically it’s even snowed on the HOCR as well as rained – but thankfully I only endured a few chilled winds and the sun sprinkled the river with blue and green dots of light while I walked miles of the riverside to catch a glimpse of the GaTech crew team. Ultimately the drama of a lost skeg and hair raising Eliot Bridge turns proved the demise of any successful winning for the GaTech team but what a beautiful spectacle to admire! The second of my three firsts involved taking a mini-vacation all alone. While I don’t recommend it I feel slightly empowered by it and less devoted to the idea that one day I too will be arguing with my significant other over why I tipped the taxi driver so much. You see, when traveling alone the bargaining of tourist site choosing, food fare choices, and timeliness of morning preparation are simply gone. You don’t have to deal with any of the aforementioned and you can be quite cavalier about it. Things you will do, as verbalized, “I think I’ll just lay here in this bed until 10:00AM – for the hell of it.”, “Hmm. I’m going to spend hard earned money on a taxi even when there are subway systems.”, “I think I’ll go to Dunkin Donuts for dinner tonight.”. See? Cavalier. Devil may care because I’m only out to please one person on this trip and that person just had three chocolate covered donuts for dinner. The final ingredient to my Boston trip was the use of an Air Bed & Breakfast. You can find such accommodations on the AIRBNB website. As stated earlier in this post there were thousands of people in Boston for the regatta. I diligently searched high and low for a modicum of lodging but couldn’t find anything for less than $400.00 per night. When I say modicum I mean a decent hotel with doors on the inside. When I couldn’t find anything I remembered a friend telling me about the less expensive alternative she used to find accommodations–and she seemed to be a seasoned traveler, so what the heck? I went to the site and sent 4 messages to various places. I would have preferred an entire place to myself or at least a private bathroom but again, busy weekend! Luckily I found a place in Cambridge, which is very close to Harvard Square, which in turn, is very close to the HOCR event and the mass transit system. Each owner puts photos of said accommodations on the web site so you can get a look at the location and room. It’s all very personable as the owner should contact you pretty quick and then the negotiations begin. Meaning what time you may arrive, how you will get keys, and maybe even a pickup from the airport. Overall my experience was great but being a hotel junky there are a few things that I had to get used to. The first of course was the non-private bathroom. I shared it with a couple who were visiting from the UK. I only saw the woman once. It was morning and when I got tired of waiting for the shower I went to peruse the snacks in the kitchen. As I entered the hall said woman came out of the bathroom with a towel wrapped around her and said, “Bathroom’s all yours!”. How nice. I didn’t even know her name but I can tell you she wore white. A white towel. Sharing a bathroom isn’t as bad as I thought it might be. You learn to listen for clues like old creaking wood floors to tell you when there is no chance for a midnight encounter in the hall. Cell phones come in handy as night lights and I was even okay with putting on my pants before exiting into the small hallway. One major problem can, and did, occur. I got locked out. Yes, I don’t even know how I did it but I locked myself out of the bedroom. Thankfully I had taken a full set of clothing into the bathroom before showering–and I’m sure I look good in a white towel too but thank God I didn’t have to share that with the grocer on the corner. Yes, it gets better. When I realized I’d been locked out of the room I quickly ran outside thinking the other guests had not left yet. Can you guess what happened then? The front door swung shut behind me. Now I was completely locked out of the house. Barefoot. No jacket. It was chilly. I panicked. No front desk to go running to for an extra key. My hotel snobbery had done me in! As chilled toes pointed me to the corner grocer (a very nice Formaggio) I mentally kicked myself several times and I could do it with gusto because my toes were numb. Quaint America eyeballed my bare feet as I crossed the dirty sidewalk and into the store. I curled my toes back as if to magically make my feet shoe like. The floral counter girl looked at me and then at my bare feet. I had to explain my plight and asked to use the phone. The rift: my cell phone was also in the bedroom. Who could I call? I only remember two phone numbers. My son and my sister. Since my sister is in Georgia she can’t help me. So I called my son and had him log into my email with his smart phone until he could find the owner’s contact info. Once he did I left voice mail after voice mail trying to raise the woman so I could get back into the house. Unfortunately she never answered. I ran back to the house to try windows and look for spare keys hidden. Nothing. I waited patiently on the doorstep all the while thinking how cold my toes were and what an ignorant predicament I was in. I now had time to value the rationale that it just wasn’t time for me to leave the house. I then decided to visit the grocer again and to my surprise the owner had called them back looking for me. She couldn’t leave where she was at but there were spare keys on the desk in the garage. Which was open. Sitting right on the desk. In the open garage. Here I was dealing with worrying about hotels with doors to the outside and the keys to the house I’m staying in are laying on a desk in plain site. Well that’s the same as hackers figuring out the key card locks on so-called secure inside hotel doors; right? I went back to the house and grabbed the keys. I got into the house but none of the 32 keys fit the bedroom door. 32. Keys. I tried each one. Twice. I had to go back to the grocer. By this time I’m an old friend who admires the lovely pears while I stand in the aisle out of the way. With curled toes. I called the owner and surprised her with the fact that I still could not get into the bedroom. She then laid out a very specific set of instructions to acquire said key. “Go to the basement.” I’m thinking, Oh God, not the basement. “In the basement there will be a white door. You will go through that door to find another room. In that room there will be a set of paneled doors on each side of the room. Open the left panel doors.” I’m listening and thinking that I may have never even woken up this morning, that this is in fact a dream. “In that closet you will see a bunch of wires. Below that is a lock box. On top of that lock box there is a key. Open the lock box.” I’m listening and mouthing the instructions while watching white America buy fresh flower arrangements, organic leafy greens and high protein energy bars. “In that lock box you will find the key you need.” I hang up and wonder about the savings of the AIRBNB versus a hotel with inside doors and a concierge who would be unduly concerned about my bare feet. He’d probably suggest a good shoe store. I found several sets of keys but did eventually open the door and was able to get over that high drama to enjoy the rest of my Boston visit. While I will use an AIRBNB again I think it best to stipulate what to do in case of an emergency. On my final day I enjoyed utilizing the mass transit system and visiting the Museum of Fine Arts.